Before WordPress and Google Maps technology even existed, people had to figure out a way of showing their business location for potential customers on their site. Some would create custom images, others were simply write the address and leave users to find it on their own. But today, there are no excuses – pinning the location of your choice can be done within a few clicks of the mouse button and gives you an amazing map for your WordPress site in seconds. In today’s article, we’re about to show you one of the fastest WordPress plugins which can show any location on Google Maps for you. 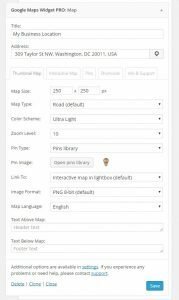 Google Maps Widget is a free WordPress plugin which you can download directly from the WordPress plugin repository. It has 100,000+ active users and more than 4 years of active development. But if you want to make the best out of the maps plugin and gain additional features, we would recommend the PRO version. We’ve got a few copies of Google Maps Widget PRO Unlimited licenses (worth $39 each) to giveaway for free as well(see the giveaway at the bottom of the page)! The first thing we would like to accentuate here is the speed of the plugin. While other similar plugins will load an interactive map with the rest of site, Google Maps Widget takes a different approach. Instead, GMW renders a thumbnail image of your custom map and allows users to decide when to go interactive. By doing so, this plugin goes from taking about 70 server requests to just 1 request! That speeds up your site and saves you precious bandwidth. There you go! Your first map is now ready to be published and displayed in front of your visitors. Since this is the simplest version of the map, now it is time to customize it in more details. We suggest that you go back to widget settings and try out several map modes, skins and icons. …and now for the giveaway! This is your chance to get a free copy of Google Maps Widget PRO Unlimited. To enter simply complete one or more of the simple tasks with the widget below, the more tasks you complete the more chances you have to win. If you have any questions about the Google maps plugin please feel free to comment below and I will get an answer for you.